I am sure you already know that GMT -00:30 time is not used by any country in the world. But I designed this GMT-00:30 Flash Clock SWF timer for those who need to see the time of GMT minus 30 minutes. 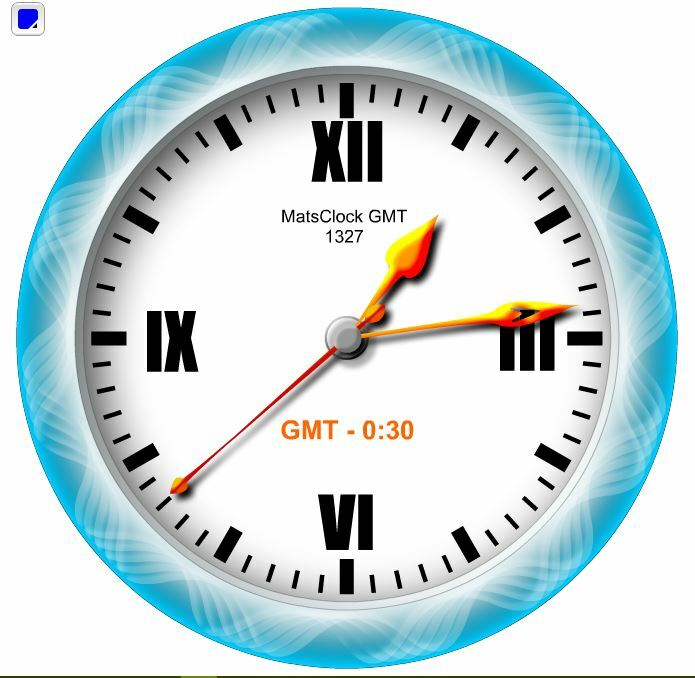 If you don't like the color of the clock please use the color square on left top of the flash clock MatsClock-gmt-1327. Flash will work only on your desktop and not in your web browser. So I have put only a picture of the GMT clock for you to see how it looks. You can download the clock above and run on your PC/Laptop. The GMT-0:30 or half an hour less than GMT time is presently not in use by any country. GMT-0:30 was known as Sandringham time and was in use in British Royal house hold till it was stopped in 1936. It was probably King Edward VIII in whose reign this time was stopped because it caused a lot of confustion. GMT-0:30 time zone was also used in Switzerland known as Bernese Time till the Central European Time was adopted in 1894. Today GMT-0:30 is not being used as country standard time by any country.